Maharashtra Institute of Technology was founded by Dr. Vishwanath D. Karad in the year 1983. After sometime MIT school of Distance learning was started and it offered wide range of Distance learning courses. There are variety of Dual Degree courses, post graduate, diploma, post graduate diploma and certified courses offered by its distance learning programs. It is affiliated to DEC, UGC and AICTE. 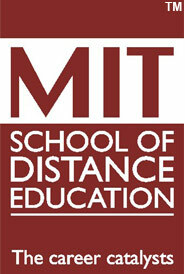 You must visit the site of MIT School of Distance learning http://www.mitsde.com/. Fill the application form correctly and then attach the required documents with it. Now choose the payment mode and pay the amount for admission. If you want to submit application form to the campus then download the form. Fill it completely and then attach the documents required with it. The payment will be accepted in form of demand draft. Course Fee: All dual degree programmes have the fee of Rs.48500 or $2400. Eligibility: You need to have a bachelor degree or diploma to do dual degree program from MIT School of Distance Education. Course Fee: All Post Graduation programmes have the fee of Rs.48500 or $2400. Eligibility: You need to have a bachelor degree to do post graduation course from this university. Duration: All Post Graduate Diploma programmes have the duration of 1 year. Course Fee: All Post Graduate Diploma programmes have the fee of Rs.42000 or $2000. Eligibility: You need to have a diploma or bachelor degree. Course Fee: All Diploma programmes have the fee of Rs.19000 or $1000. Eligibility: You need to have passed you 10+2 schooling. Duration: All certified programmes have the duration of 6 months to 1 year. Course Fee: All certified programmes have the fee of Rs.7000 or $150. Eligibility: You should have the suitable required education level as mentioned in the university site.